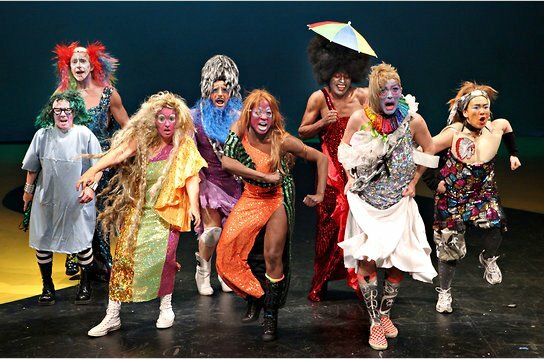 The cast of “Walk Across America,” each sporting Darrell Thorne’s clown makeup and Machine Dazzle’s thrift-shop couture. At the tail end of Mark Russell’s annual, ever-enterprising Under the Radar Festival, I made it a point to finagle tickets to one of the final performances of “The Walk Across America for Mother Earth,” a collaboration between Taylor Mac (who wrote the play and performed in it) and the Talking Band, stalwart veterans of downtown experimental theater. The play tells the apparently pretty much true story of Taylor Mac’s involvement in an actual 1992 grass-roots march from Pennsylvania to Nevada by activists demanding that the government return to the Shoshone people land that it had appropriated as a nuclear testing ground. But it’s no kind of earnest documentary. The show combines ramshackle vaudeville, a Mickey-and-Judy version of commedia dell’arte (on LSD), and a real play that channels Chekhov and“The Wizard of Oz.” The characters are a ragbag assortment of counterculturalists, including Marsha (Tina Shepard), a lesbian with cancer whose treatment includes drinking her own pee; King Arthur (Steve Rattazzi), a former Vietnam Veteran and Hell’s Angel who’s now homeless by choice; Nick (Will Badgett), an African-American mental patient who got turned out of the hospital because of Reagan Administration cutbacks; and a couple of Belgians obsessed with Native Americans, Rainbow Carl (Jack Weatherall) and Jimica (Nikki Zialcita). Taylor Mac plays Kelly, a mere slip of a newly out girlyboy activist who joins the march with his BFF Angie (Daphne Gaines), who carries around her own soapbox and mounts it frequently to deliver her latest diatribe. Almost as soon as this band of outsiders hit their version of the Yellow Brick Road, they start squabbling over the fine points of political consensus and engaging in all manner of sexual/romantic intrigue. The cast is a perfect mixture of Taylor Mac’s rowdy band of downtown burlesque-meets-Radical-Faerie performers and the Talking Band’s game-for-anything multidisciplinarians. All of them are decked out in a style that Mac has become known for (familiar to those who caught his Obie Award-winning five-hour epic “The Lily’s Revenge”): highly colorful to-each-his/her-own clown makeup (designed by Darrell Thorne) and spectacularly tattered and layered and spangled thrift-shop couture by the incomparable Machine Dazzle. For instance, Greeter (played by former King of Boylesque James Tigger! Ferguson), who lives at a gay commune in rural Tennessee, sports butterfly wings, go-go boots, tassled knee bands, a cascading wig in multiple shades of purple, a crinkly blue beard, and a handbag shaped as a pair of fire-engine red lips. Mac himself channels the theatrical extravagance of Charles Ludlam and the southern innocence of Gomer Pyle with the gender-rebellious performative air of Justin Bond. But he doesn’t hog the spotlight in the slightest. Each of the characters gets a share of good lines and all the shtick they care to dream up. Talking Band’s Ellen Maddow, who plays Flower (the marcher most likely to be voted off a less politically correct island) composed a number of simple, sometimes very short songs that the cast performs (accompanied on guitar by Viva DeConcini) with more precision and flair than the clownish mise en scène would lead the audience to expect. The play is a sweet, tangy, funny, overlong Taylor Mac extravaganza that never completely disappears into silliness. At heart it makes a strong case for the struggles of outsiders to band together and the ongoing dilemmas of political activism. “Success is just failure biding its time,” a key line early on, comes back as “Failure is just success biding its time.” The touching final tableau reminded me of the very end of Bertolt Brecht’s play “The Visions of Simone Machard,” whose title character is a young German girl inspired by Joan of Arc to fight the German occupation of France. She asks her angel, “Should we go on fighting if the enemy has already won?” He responds: “Is the night wind blowing? Isn’t there a tree in the yard? Do its leaves rustle when the wind blows?” Powerful words and images in this time when great political change abroad challenges the great political inertia of Americans.